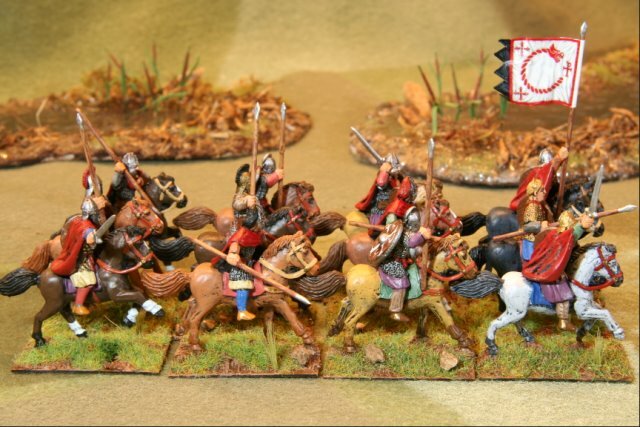 Here are a few photos of the beginning of what I hope to be a large Arthurian army. By Arthurian, I mean the historical King Arthur of the post-Roman Britain period before the Dark Ages who fought the Saxons and the Picts, and not the fantasy medieval king who pulled a sword from a stone, danced around with Merlin and Guinevere, and searched for the holy grail. The historical Arthur may well be a myth, but there are many writings on a strong British King, who unified his countrymen, and fought and won against all sorts of foreigners. 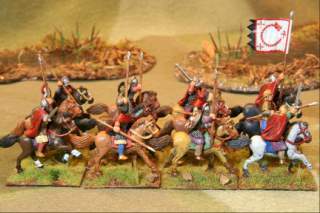 The horsemen are Gripping Beast 28 mm miniatures. The front rank from left to right includes King Arthur, a standard bearer, Modred, and a crested retainer. 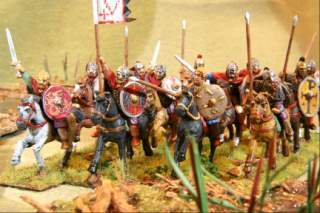 Some of the other figures include a few horse-tail helmeted heavy cavalry, and a few with ceremonial helmets much like the Sutton Hoo find. I base them on rectangular 25 mm by 40 mm bases because I like tight compact formations. All figures are painted with Vallejo and Foundry acrylic paints. It is thought that King Arthur lead his people in the 5th century. However, there is much speculation over which people he actually lead. David Nash Ford has a nice article on the possibilities. 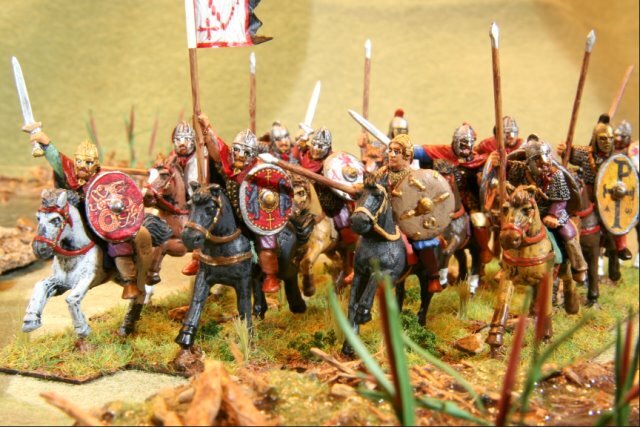 The stereotype is that he lead a heavy cavalry unit and ruthlessly defeated his foes. 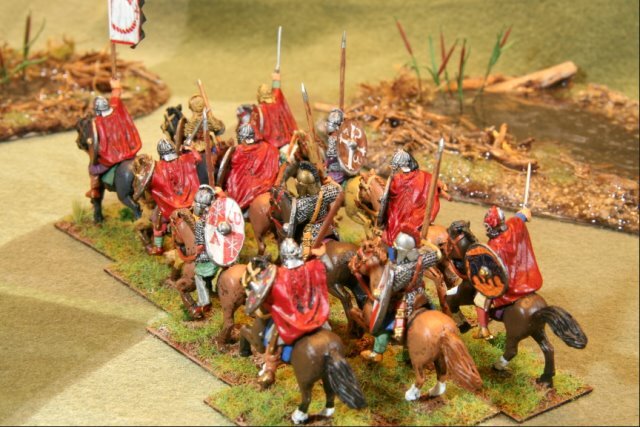 The unit banner and shields were made with Little Big Men Studio transfers. The artwork is excellent, although I am still struggling with making realistic shield edges and covering any bare spots without blotching paint all over the transfer. The swamp terrain pieces in these photos are a kit from Scenic Express. They are primarily a model train site, but they seem to have the state of the art in miniature flora and scenery. I've been paying more attention to horses lately. From left to right we see a brown, a chestnut, a dun, and a white horse. There are also some bays, blacks, and grays in there. Some have socks and stripes. All are slightly different. A good, short reference for horse types and colorings is Usborne Spotter's Guide of Horses & Ponies. And now the heavy cavalry unit heads away. Note the "Chi-Rho" greek letter symbols on many of the shields. These symbols indicate that Arthur was a Christian as chi rho are the first letters in the Greek word for Christ. I balanced these shield symbols with pagan symbols suchas twisted beasts and bears. I envision Arthur as a man on the edge between ancient pagan and modern Christian times. 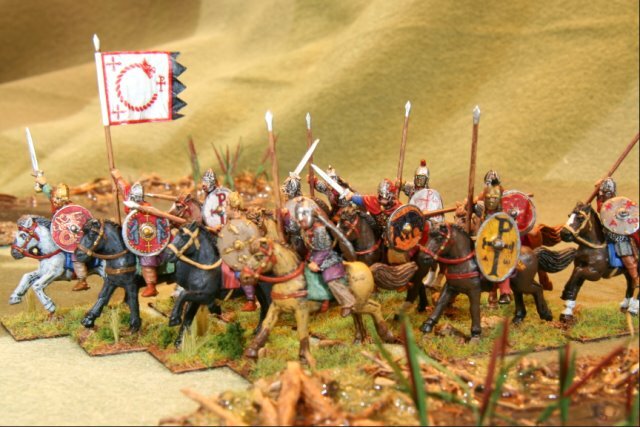 The red capes show the unit's heritage from Roman times in Great Britain. Thanks for reading about my 28 mm Arthurian figures.More miniatures and scenery photos are located at the Miniatures section. There will be more photos placed here as the restof the Arthurian army assembles. Last modified: Wednesday, 05-Sep-2018 14:24:09 MST.